Collaboration can be the key to success, no matter the organization. Earn an online bachelor’s degree in organizational leadership online from Maryville University that can prepare you to strategically and thoughtfully lead teams through organizational change. It was developed to align with business needs now and connects you to courses that blend business with psychology. Graduates can emerge as change agents in business, healthcare, government, nonprofits, and more. 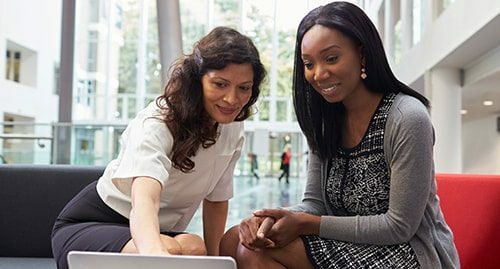 When you earn your organizational leadership degree online, you can access courses that blend business, human resources, and leadership with psychology to help prepare you to better lead teams. It’s our goal to connect you to the human side of organizations, so you can act as a change agent. 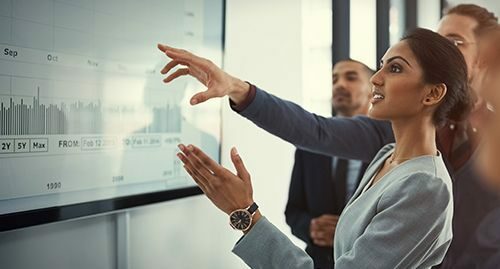 Our online bachelor’s degree in organizational leadership places an emphasis on critical thinking, change management, and understanding the collaborative mindset that influences organizational behavior. During your senior project, faculty members guide you as you complete research in your area of interest. At Maryville, you consult with our faculty experts every step of the way. Here, you can build in-demand skills and learn to lead businesses in your preferred industry by accessing an easy-to-use platform that’s fully supported and uses leading education technologies. The online bachelor’s degree in organizational leadership is designed to help support your individual career goals to prepare for a leadership role in any field. It includes general education, the organizational leadership major, a social science research sequence, and electives. Our curriculum helps you focus on change leadership, conflict management, evidence-based and ethical decision-making, strategic communication, and critical thinking. Through this lens, you complete courses in group dynamics, organizational development and change, human resource management, business law, and other key subjects connected to organizational leadership. It concludes with a senior research project guided by a faculty member. Qualified online leadership degree students can satisfy the general education requirement through eligible transfer credits to complete the program sooner. Organizational Leadership Major Courses — Learn to develop strategies for leading and inspiring others as you explore topics in organizational behavior, psychology, communication, conflict resolution, business negotiation, law, and human resources. What Can You Do with Your Online Bachelor’s Degree in Organizational Leadership? Your online bachelor’s degree in organizational leadership helps you develop skills to introduce positive change, manage organizational conflict, provide superior employee training, and more. Graduates can emerge prepared to meet the needs of a range of organizations today, because you choose electives to tailor your degree to fit your area of interest. It’s how the degree works to support your career goals. Practical. Collaborate with a faculty member on a research project relevant to your area of interest. Get supportive and attentive faculty advice. Discuss your goals with dedicated faculty, who help you connect the curriculum to your career vision. online bachelor’s degree in organizational leadership ? The U.S. Bureau of Labor Statistics projects that jobs for online leadership degree grads will increase faster than average for all other occupations. Growth is particularly high for management analysts (12%) and human resources managers (9%). Average salaries in organizational leadership can vary, with some exceeding $100,000. Our business leadership program can help you qualify for these jobs and median salaries: compensation and benefits manager ($116,240), training and development manager ($105,830), and management analyst ($81,330). As businesses seek tech-driven employee training methods and structures to manage remote workers, there’s growing demand for training specialists who can help bring about organizational change. Emerging technology factors in as well, with more companies using social media and e-learning. Why Choose Maryville University’s Online Bachelor’s Degree in Organizational Leadership Program? At Maryville University, our organizational leadership degree online offers a path to help you become an effective decision-maker in any organization. Your major includes courses that help you advance with a unique blend of psychology and business skills. We aim to help you stand out as a strong leader positively directing change in today’s organizations. Our online bachelor’s degree in organizational leadership was developed to provide skills today’s employers seek. That’s why our curriculum is informed by employer insights. You will also graduate with a research project completed in your advanced coursework. Connect to our faculty of experienced leaders. Amy Quarton-Dambacher is an associate instructor at Maryville, where she has played a key role in developing the online bachelor’s degree in organizational leadership program. She teaches courses in leadership, organizational behavior, industrial/organizational psychology, and group dynamics. Along with her course instruction, Amy also provides guidance for students seeking internships and other professional opportunities. Outside of academia, her expertise is highly sought after as an independent consultant. Amy is the founder and CEO of The Job Fit Company, and she serves as the internship coordinator for the St. Louis Organization Development Network. As you rise through leadership, your career may lead you to seek additional skills to continue advancing. Whether you plan to pursue a different industry, leadership role, entrepreneurship, or additional speciality, Maryville can help you take your education further. We provide a variety of paths that can help you advance to a higher level in the future. We offer online master’s degrees in business administration, health administration, and more. MBA, with your choice of nine concentrations. Master of Health Administration (MHA), with a general MHA or your choice of four concentrations, including healthcare strategies, data management, and more. Learn more about the online bachelor’s degree in organizational leadership at Maryville University.